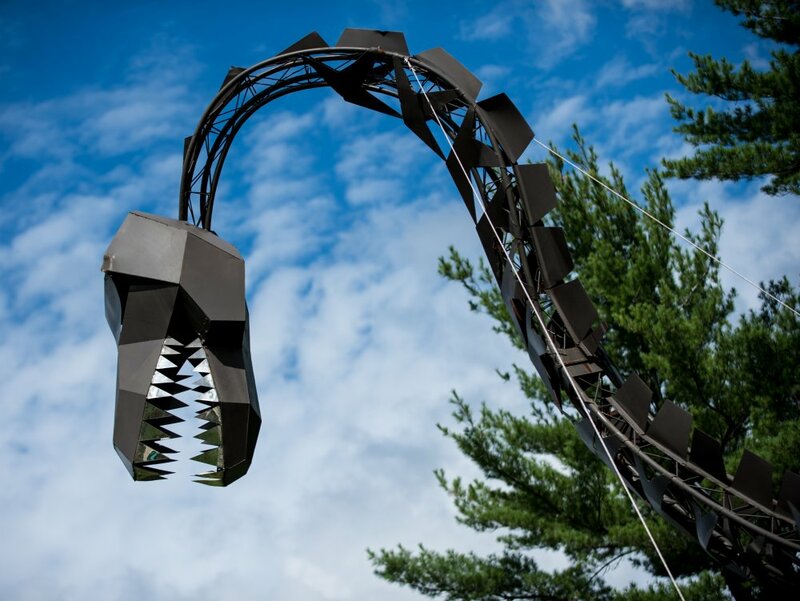 Built in 1994, the giant metal dinosaur that looms over Blue Mountain Road quickly became a staple of the Rip Van Winkle Campgrounds. The dinosaur was named ‘Pickles,’ after receiving an overwhelming vote in popularity in a contest conducted by the campground with help from Camp Good Days and Special Times Inc. Campers of Rip Van Winkle Campgrounds suggested names for a donation of $5 that benefited Camp Good Days. From there, campers of Camp Good Days decided on the final name based on the list of suggestions. For 25 cents, Pickles sprays water from its mouth inviting campers and visitors alike to stop by and test it out – or at least pose for a quick photo-op. 38 feet tall and 49 feet long, Pickles the Dinosaur clearly stakes out the entrance to the camps “Fun Zone,” which also includes an outdoor movie theater, swimming pool, R/C tracks and more. But Pickles the Dinosaur didn’t just come about overnight. In fact, he was a long work in progress. Dan Hubp of New York City-based MEGA collaborated with Chris Lawrence of High Falls’ O&S Engineering to design and build the display. Before Pickles turned into the four-ton sculpture it is today, he was no more than a sketch scrawled upon a napkin. After 40 more pages of drawings, the duo finally settled on a final design. Pickles the Dinosaur is built to withstand wind speeds up to 75 mph. 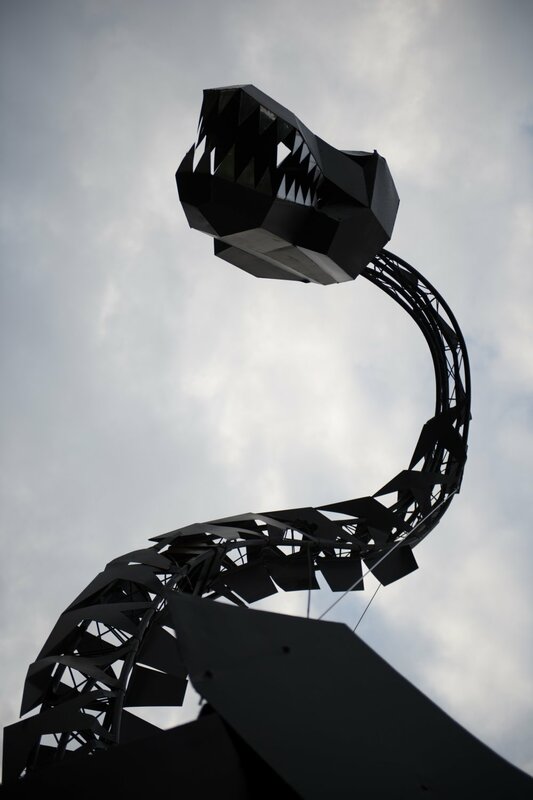 Created by Benson Steel, Pickles the Dinosaur is built to withstand wind speeds up to 75 mph. For some time, the structure was actually housed at R.I.C.H Farms, an attraction of Glasco Turnpike. When R.I.C.H Farms went up for sale, they contacted Brian and Eric Ellsworth, the owners and operators of Rip Van Winkle Campgrounds to potentially become the dinosaurs new ‘parents’. The Ellsworth’s agreed to give the dinosaur a new home, and in turn, Pickles the Dinosaur is one of the most notable attractions of the Rip Van Winkle Campgrounds. Campground Features Camp Good Days Fun Zone Roar!